The MeyeSight Visual Fitness Test tests important aspects of eye sight and allows you to monitor changes to your vision over time. This app does NOT diagnose or attempt to suggest treatments for disease. Any abnormal test results or changes in results over time should be interpreted by a qualified health professional. Abnormal test results do not point to any one disease; results can have multiple explanations. But they do raise a red flag that you should pay attention to. Detail vision (usually referred to as visual acuity) describes the acuteness or “sharpness” of vision – the ability to perceive small details. This is the aspect of vision tested with the familiar letter chart test and many vision testing mobile apps. The result of this test is known as “visual acuity”; it indicates the smallest detail that can be recognized. Because a reduction in visual acuity can be an indication of a wide variety of eye problems, the test remains a very useful tool, still In use after a century and a half. Because of this broad sensitivity, detail vision is not a diagnostic test; visual acuity alone cannot determine the cause of the vision loss. Detail vision loss is only a red flag which should encourage you to see a doctor. Because visual acuity is so easily measured, it is often used as a primary eligibility criterion for things like a driver’s license, a pilot’s license, and for certain disability benefits. However, the ability to perform various tasks depends on many more factors than visual acuity alone. For those disorders that affect detail vision, an acuity test is a good follow-up tool to document whether a condition is worsening or improving or to record the effect of various interventions. Because visual acuity is a useful test to describe the quality of vision and to screen for defects, many equate visual acuity with quality of vision. In actual life many other parameters interact with visual acuity. One of the important ones is contrast. Detail vision measures the ability to recognize small objects with high contrast. Often however, the visibility of objects in our environment is limited more by lack of contrast than by their small size. Contrast sensitivity is the ability to detect and recognize differences between an object and its background. Difficulty seeing the edge of steps when going downward is an example of diminished contrast sensitivity, as are a pedestrian who misses a curb or step or a driver who does not see a pedestrian on a dark road. In many surveys, contrast sensitivity is the visual parameter that is most closely related to problems experienced in activities of daily living. Like visual acuity, contrast sensitivity loss is not disease-specific. It can indicate optical problems (such as refractive errors or opacities), disorders of the outer retina (such as macular degeneration), or neural problems that might occur in the inner retina (such as glaucoma), the optic nerve (optic neuritis), or in the brain and visual cortex. The consequences of contrast sensitivity loss are significant, since many activities of daily living involve objects of less than optimal contrast. Those with contrast problems often notice that something is wrong, but they cannot pinpoint it. They become frustrated patients when told not to worry because their high-contrast visual acuity is normal. Test results that indicate significant contrast sensitivity loss might suggest being proactively cautious, avoiding night driving and other low-contrast situations that might result in a fall. Providing better contrast and better illumination in the home can also improve many tasks. Objects that are not in the line of sight are in your surround vision or visual field. The visual field test quickly screens for defects in the visual field – areas of either disturbed vision or lost vision. These are called scotomas. The MeyeSight surround vision test allows you to become aware of your scotomas, which in turn allows you to develop strategies for adapting to these areas of diminished vision. If you have no known eye disease but have concerns about your vision, you can use the MeyeSight Visual Fitness test to verify that your eyesight is within normal limits for the aspects tested (acuity, contrast and visual field). The MeyeSight Visual Fitness Test can detect vision problems that may not have shown up on a simple letter chart test. If you know you have an eye disorder, and if you are being monitored by an ophthalmologist, you can use the MeyeSight Visual Fitness test to monitor your eye sight between doctor’s visits. You can compare test results over time, and you can show them to your doctor at your next visit. While the MeyeSight Visual Fitness Test can detect many eye sight abnormalities, it will not detect all disorders. If your results are out of the normal range or if they are getting progressively worse, you should see an eye doctor. This app is meant to raise a red flag when abnormal results are found. Since any finding can have multiple explanations, all abnormal test results should be interpreted by a competent health professional. This app is not sufficient by itself to diagnose or treat anydisease condition. 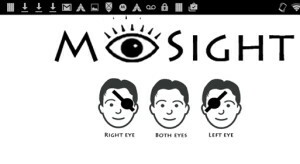 The MeyeSight Vision Fitness Test can be used on Android phones, iOS phones or tablets (iPhone or iPad). For the visual field component, the larger the screen, the larger the visual field area covered. On smartphones the app allows monitoring of blind spots near fixation, as in macular degeneration. On full size tablets the app also allows monitoring of blind spots that are farther out, as in glaucoma. Because the screen size and resolution of mobile devices varies widely, each device you want to run the test on must first be calibrated. You only need to do this once for each device. 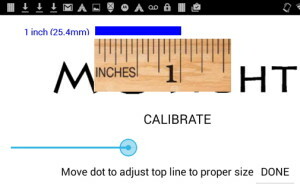 If your device has not yet been calibrated. you are asked to do so before beginning the first test. It’s best to use a ruler or tape measure if you can. Slide the slider until the dark blue bar is one inch long. Hold the screen at approximately 16″ (40 cm). Try to avoid strong sunlight shining on the screen that will wash out the display. Also, position yourself so that there are no distracting reflections on the display. Note: The tests only run with the device in horizontal mode. If you try to turn the device to display the test in portrait mode, the test will remain in horizontal mode. Since the conditions of your two eyes may well differ, it’s best to test each eye separately, one test for the right eye and one test for the left eye. Testing with both eyes open often will not reveal problems that exist in one eye only, as one eye can compensate for defects in the other. Testing with both eyes open can be interesting, as it can demonstrate the extent to which one eye is compensating for another’s defect. Select the eye you want to test. 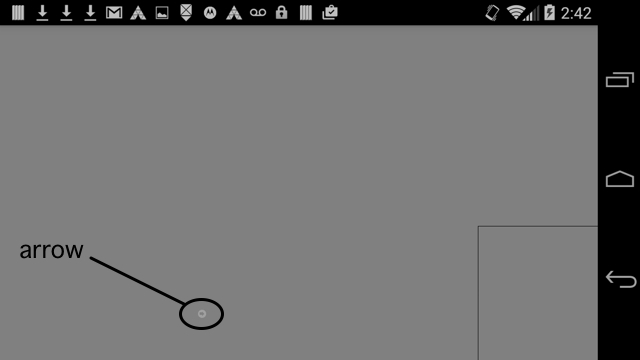 For each test your task is to observe the pointer (arrow) on the screen and then swipe in the box at the bottom right of the screen in the direction of the pointer. Hold your finger over the box in the lower right corner of the screen. When you see a pointer on the screen, swipe with your finger in the direction indicated by the pointer (up, down, left, or right) . The next pointer will appear on the screen. Swipe again in the direction that pointer is pointing. Continue until the test concludes. After each test is completed, you are asked whether you want to save the test results. Each test is saved as images that you can compare with earlier results. You can share the test result images with others, including your doctor. To protect your privacy, they are stored separate from your picture gallery, so that they will not be included in automatic uploads to social media or to other sites. To share them with your doctor or with others. you must explicitly request the transfer. The pointer is black on a white background (high contrast). After you swipe a new pointer appears. If you are uncertain about the direction of the pointer, you may guess. The pointer will not change until you have swiped in the direction of the pointer, so continue to swipe. Each time you swipe correctly, the next pointer will be smaller. If your swipe is in the wrong direction, the next pointer will be larger. The computer determines when you have given enough responses to estimate your visual acuity. 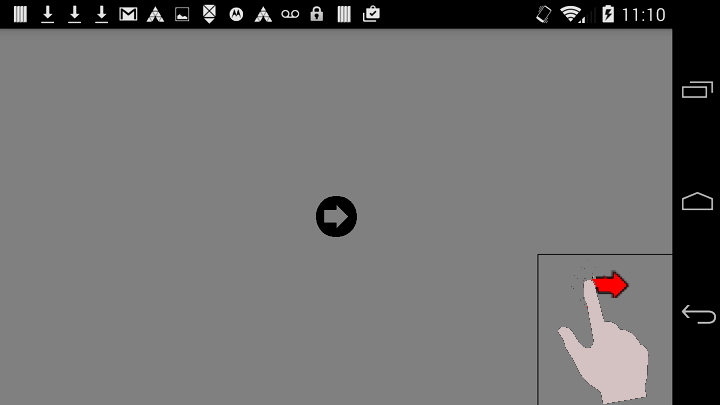 As the pointer gets smaller, it is natural to want to bring the screen closer. Resist this temptation. For accurate results, your viewing distance must remain at 40 cm (16″) for all three tests. To determine sensitivity to contrast changes, the MeyeSight Visual Fitness Test repeats the visual acuity sequence with the pointer symbol presented at lower contrast (gray on gray). 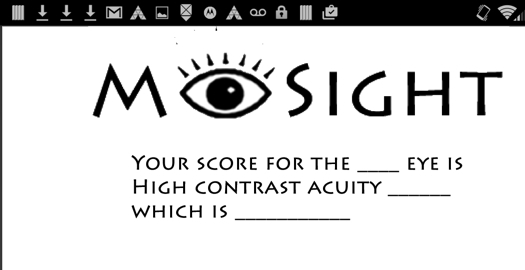 You will not do as well as with the high contrast acuity test. It is the difference between your high contrast and low contrast performance that indicates your contrast sensitivity. 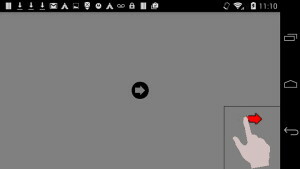 The pointer appears in different locations on the screen. Again swipe when you see the pointer. Respond as quickly as you can without rushing. When your response is correct, a new pointer appears in a new location. A new pointer will not appear until you swipe correctly, so keep trying. The larger the screen on your device, the larger the retinal area that can be tested. You can test for field defects close to fixation (as in MacularDegeneration) on a small screen (such as the original iPhone), while testing for defects that are farther from fixation (as in glaucoma) requires the larger screen of a full sized tablet (10” or more). The Interpret button provides a brief explanation. is this explanation or result? You can save the test results or abandon them. More than one person’s results can be saved on a device. At the end of the three tests you have another opportunity to ask for interpretation. ?? ?see results? The visual acuity sequence determines the smallest detail that can be recognized when presented with high contrast. Lack of correction or under-correction of refractive errors, which can usually be corrected with more appropriate glasses or contact lenses. Retinal disorders such as macular degeneration and glaucoma, which require medical treatment. You can not diagnose any of these conditions from the findings of a visual acuity test. Noticing a deficit or a change in acuity indicates you should seek a professional assessment for diagnosis and for possible treatment. Again, contrast sensitivity loss by itself cannot diagnose any specific condition. It can, however, be an indicator of the need for a more comprehensive professional examination. Low contrast test scores indicate a need to arrange various activities in such a way that contrast and/or illumination are optimized. Simple changes can often lead to a significant easing of problems and enhancement of quality of life. For example, better illumination and enhancement of contrast in the environment are often more helpful than magnification. Contrast tests are usually not a routine component of professional eye examinations, leaving many people aware that they have a problem, but unable to pinpoint what that problem is. Visual field test results that indicate areas of diminished or lost vision (scotomas) act as a screening tool; they may indicate one of several diseases and require professional assessment. If you are in treatment for a disease such as glaucoma, your doctor may be measuring visual fields to judge the effectiveness of their therapy, but they may very wee not be discuss the results of those tests or the implications of the field loss. You can recognize letters, but find it hard to see longer words. You can see a face across the room but have difficulty crossing the room, stumbling or bumping into objects. Your vision may seem like Swiss cheese, with holes into which objects seem to disappear. You see an object at one point, but then when you move or move your eyes it disappears. “Now you see it, now you don’t”. These blind spots are technically known as “scotomata”.